Passports for Missions: Just for Fun & Just in Case! Have you ever considered traveling internationally, or taking a family mission trip? I was eight years old when God called me to missions. As a little girl, the Lord “spoke” to me at a Christian family camp through Jeremiah 1:4-8 about going “to the nations.” At sixteen, I headed to Mexico on my first mission trip; as young newlyweds, my husband and I surrendered everything to go wherever God would call; and for over 30 years, our family has been actively involved, all across the globe, in fulltime international missions. We’ve ministered together as a family, in teams of two or three of us at a time, and as individuals. We’ve tasted strange foods, experienced fascinating cultures, and have seen – with our own eyes – some incredible needs. We’ve always lived in the United States, but by God’s grace, His call on our lives has taken us, collectively, to over 100 nations on all 7 continents. We’ve dreamed some big dreams . . . and little dreams. We’ve rescued hundreds of orphan kids, established village churches, and made friends with our neighbors (and shared the Lord) during local soccer games. To our family, “MISSIONS” is not an extra-curricular subject or an optional supplement to our Christian life; living for God’s Great Commission is the central core of everything we do. Geography is more than a map and a textbook. World News is more than a “take-it-or-leave-it” headline report. Living with a mission perspective has dramatically impacted our our family, our parenting, and our life-purpose. If you and your family want to be a part of God’s Great Commission (Matthew 26:19 and Mark 16:15 – to “Go into all the world and preach the gospel”) . . .
DO YOU HAVE YOUR PASSPORTS YET? 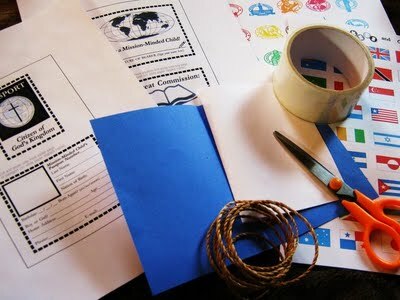 Included in this article are instructions to make mission-minded “Passports” – as a fun craft project and learning tool. However, I want to motivate you to go one step further and to apply for “real” passports for each member of your family. In the United States, adult passports last for ten years and child passports last for five years. Even the “process” of applying for passports is a great educational experience . . . and who knows where this simple step could lead you, or what impact this small step could make in the future, and for God’s kingdom? A printed copy of the MISSION-MINDED passport pages (here’s a PDF file of these pages), your child’s photo, scissors, glue, colored construction paper, blank white paper, yarn, hole puncher, clear packing tape, and stapler. Have your child cut out the passport pages along the dotted lines and glue these pieces to a passport-sized booklet (made from a half-piece of colored construction paper with blank white pages stapled inside). Add your child’s photo to the appropriate box, and for strength and durability cover the entire passport with clear packing tape. Punch a hole in the top left corner, and insert a piece of yarn or cording so your child can wear the passport around his or her neck. 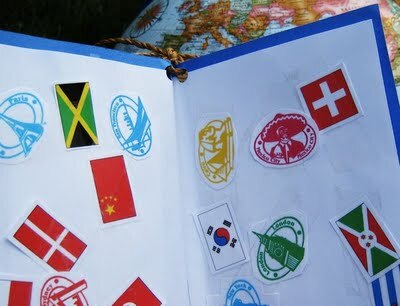 For fun, add international stickers or stamps (here are FREE printable country flags and stamps which work well with passports). 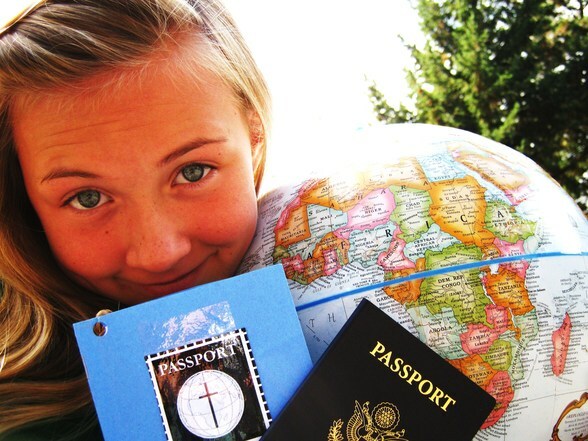 As your child learns about an area of the world, stamp the passport with a culturally appropriate rubber stamp, international flag or globe-oriented sticker, or a foreign postage stamp—all available at most teacher supply stores. This passport can be used to keep track of achievements, such as Bible memory or Bible reading progress, or to record a child’s personal prayer time as he or she “travels” around the world through intercession. 1. You’ll be ready to go anywhere in the world, at a moment’s notice. 2. You’ll instill a preliminary attitude of willingness to follow God – wherever He may lead – into the hearts of each member of your family. 3. You’ll open up a whole world of possibilities, as you pray and learn about different nations (with real passports ready “just in case”). It will change how you pray as you ask God where He may want you to travel someday, or potential mission trips He may want you to take. 1. Print out passport applications (if you are US citizens, here is the US Passport Application site: http://travel.state.gov/passport/passport_1738.html. If you are Canadian citizens, here is the Passport Canada site: http://www.ppt.gc.ca/form/index.aspx). 2. Fill out the applications. Locate documentations and IDs. Get passport photos for each family member. 3. Submit applications at your local post office, with appropriate fees. Even if your family is never called to fulltime foreign missions, it’s good to be prepared for the “possibility” of a short-term mission trip, an overseas emergency to help a friend or loved one, or even an international vacation. If you are willing to consider a mission adventure for any (or all) of your family within the next several years, I encourage you to quit procrastinating.